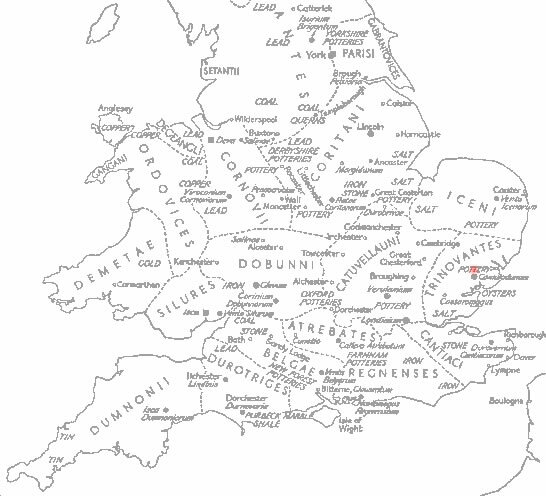 Camulodunum (Colchester) is a Romanisation of its Iron-Age name, the Fortress (dunum) of Camulos, God of War. The original site of the Iron-Age settlement Gosbecks was 3 miles southwest of the current city. This was a huge Iron-Age settlement covering a triangular area of approximately 10 miles. It was surrounded by rivers on two sides and an involved system of dykes on its open western end. These dykes are the only real vestiges of the settlement today with sunken lanes in the flat Essex countryside. Camulodunum was a hugely important site before the Romans arrived. It was most likely the royal stronghold of the Trinovantes on whose behalf Julius Caesar invaded in 55 and 54 BC. At this time the Catuvellauni under their king Cassivellaunus were spreading their authority as southern Britain's largest tribe across the south eastern counties. It seems that Cassivellaunus invaded Trinovantian territory and murdered its king, whose son, Mandubracius, fled to Caesar for help. This gave Caesar the excuse he was looking for to invade and after an unsuccessful attempt in 55 BC Caesar returned to finish the work in 54 BC. He chased Cassivellaunus back to his stronghold forcing Cassivellaunus to flee and come to terms. 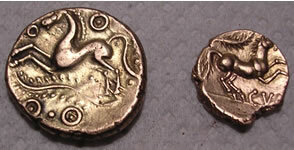 Camulodunum came into Catuvellaunian hands under the Catuvellaunian king, Tasciovanus, who ruled c.25-15 BC.By c.AD 10, Cunobelin the nephew of Cassivellaunus had taken over the area and his coinage reflects this. 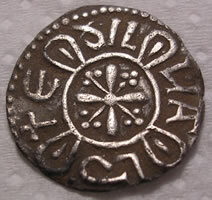 The last Trinovantian king was called Addedomaros. His remains are possibly buried in the Lexden Tumulus close to Gosbecks. The king who was buried here had been ritually burned along with his goods that were a mixture of Celtic and Roman artefacts. Among them were the fragments of a small casket and inside was a medallion bearing the head of the Emperor Augustus. When Claudius became Roman emperor in AD 41 he understood that in order to survive he needed a triumph. 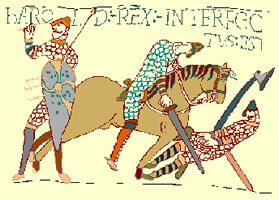 He used the appeal of the British chieftain Verica as his excuse for action. 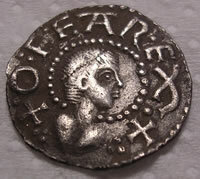 Verica was a king of the Atrebates who had been driven out by Cunobelin's successor, Caratacus. The Roman legions under Aulus Plautius landed at Richborough surprising the British army at the River Medway and pushed Caratacus back to his stronghold at Colchester. There Plautius waited for the Emperor Claudius to arrive from Rome as he was bringing additional troops including elephants with him. 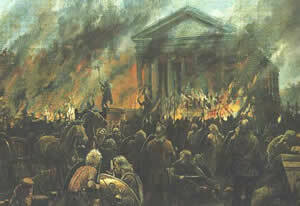 Claudius himself led the final storming of the Catuvellauni stronghold which went very like Caesar's earlier assault. Caratacus and his followers escaped in their chariots from the back of the fort and went on the run. He was eventually betrayed by Queen Cartimandua of the Brigantes and handed over to Rome to be paraded in chains through Rome. Even before it was complete the function of the fortress had been changed. The conquest of Britain had moved on and instead of a military base what Rome needed now was a colony. The Roman word colonia was a specific term for a planned town inhabited by military veterans. They would be allocated plots of land within the bounds of the settlement in order to establish a Roman presence within the conquered area. This is what the Roman fortress of Camulodunum was turned into. It became Britain's first-ever city. Doing this, the Romans quite literally brought civilisation to Britain, as the word derives from the Roman word civitas, meaning 'city'. The city of Colonia Victricensis (The City of Victory) was deliberately placed within the bounds of the Roman fortress, using its street plan and converting the barrack blocks into houses. In place of the military gate at the western entrance to the fort, a monumental arch was built, commemorating the Claudian conquest of Britain. Later when the city walls were built this was incorporated into the western gate of the city and though nothing of the actual arch now remains, what is left of the gate and its walls still stand at the Balkerne Gate. 'To Tiberius Claudius Caesar Augustus Germanicus, son of Drusus, Pontifex Maximus, with Tribunician Power for the eleventh time, Consul 5 times, hailed as Imperator 22 times, Censor, Father of his Country, the senate and people of Rome grant this because he received the surrender of 11 kings of the Britons conquered without loss, and he first brought the barbarian peoples across the Ocean under the authority of the Roman people'. The annex of the old fortress was converted into the precinct for a monumental Temple to the imperial cult. Today the site is occupied by a Norman castle which was built directly onto the foundations of the old temple out of Roman stone. Within the temple stood a life-size bronze statue of the Emperor Claudius, of which the head still survives. The local tribal elders were recruited into the temple cult but the financial burden of running the temple and the vicious maltreatment of the locals by the colonists was to be the route cause which boiled into the Boudiccan revolt. At the time of the revolt the Romans were so sure of their hold on East Anglia that there were only 200 members of the procurator's guard present .These and the local colonists were woefully inadequate to stop the tribal serge that descended upon an undefended Colchester. Tacitus says that: 'It seemed easy to destroy the settlement; for it had no walls. The Roman commanders had neglected to build walls and the archaeological record confirms that the walls of the legionary fortress had been filled in to make way for the temple precinct and other amenities. It was to this precinct that the survivors of the attack barricaded themselves into the inner sanctuary of the temple which the Celts burned to the ground with them in it. Only the foundations survive. 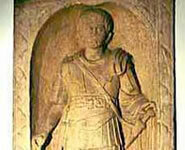 The statue of Claudius that stood there was smashed to pieces. Its head was discovered a few years ago in the River Alde a few miles from the town. There is evidence of this destruction throughout the town though it can only be accessed through rostrum pics from the archaeological excavations and a few remains. The entire town was burned to the ground leaving a black destruction layer and rubble in the soil. In places like Lion Walk more tangible evidence of this destruction has survived. From a house in this site the burned remains of a couch was recovered with it's carbonised upholstery still intact. Also a bowl of carbonised dates and one plum were also recovered. Each of these is a remarkable preservation of organic materials which do not usually survive. No human remains linked to the Boudiccan Revolt have been recovered with the exception of one charred remains on North Hill. Did the townsfolk flee or were they taken elsewhere to be massacred ? 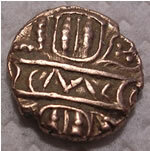 By AD 200 Colchester itself was now a fairly wealthy town. Its inhabitants could afford large well-appointed town houses whilst the wealthiest lived outside the towns in country villas. Both the sub-Roman Britons and the invading Anglo-Saxons were desperate to maintain some semblance of Roman civilisation. This is precisely what made the empire so attractive to the barbarians but they did not poccess the power or experience to make it work. Without the experience of the Roman imperial expertise in place to run the show Roman civilisation could not be maintained. This is what happened to Colchester where Anglo-Saxon settlers moved in and established grubenhauser style huts on the remnants of the Roman city almost immediately. At Lion Walk a fifth-century house was built directly on top of an abandoned Romano-British house soon after its abandonment. They even used the same street plan so that the High Street of modern Colchester still runs along the route of the Via Praetoria of the old Roman fort, with Head Street and North Hill forming a T-junction at one end along the line of the Via Principalis. As the new settlers became more sophisticated in their building techniques, they began to erect public buildings out of the rubble that was lying all around them. Colchester has several outstanding examples of this practice with the most significant of which is Holy Trinity Church. It was built during the eleventh century and is made entirely out of re-used Roman stone. 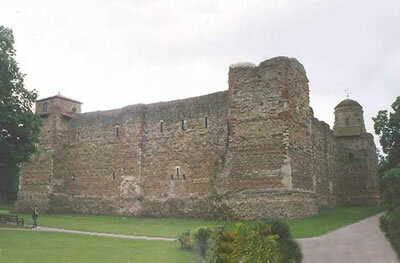 Colchester Castle which was founded by William the Conqueror himself and again out of re-used Roman stone. This great monument to the last of Britain's conquerors was therefore placed directly on the spot where the first great monument to the conquest of Britain had been erected over 1,000 years before.